The National Institutes of Health (NIH) has awarded a five-year, $1.94 million grant to a biomedical research team at Worcester Polytechnic Institute (WPI) working at the forefront of cell therapies for healing cardiac muscle damaged by heart attack or chronic disease. Funded through the NIH's premiere Research Project Grant (R01) program, the project will be led by Glenn Gaudette, PhD, associate professor of biomedical engineering at WPI, working in close collaboration with George Pins, PhD, associate professor of biomedical engineering at WPI, and Michael Laflamme, MD, PhD, associate professor of pathology at the University of Washington. "We are grateful for the support of the National Institutes of Health and we hope that this intensive program of research will advance cell therapies for people who suffer from heart disease," Gaudette said. The multifaceted research program funded by the NIH grant is based on the use of biopolymer microthreads to deliver adult stem cells into damaged hearts to promote muscle regeneration. The microthreads, each about the width of a human hair, can be braided into cable-like structures that mimic natural connective tissues. First developed in Pins's lab as a potential tool for repairing torn anterior cruciate ligaments (ACL) in the knee, the microthreads were transformed by Gaudette and Pins into biological sutures that can be used to stich stem cells directly into wound sites and damaged tissues. During a heart attack, vessels that deliver blood and oxygen to the heart are choked off, damaging sections of cardiac muscle. The damaged or "infarcted" muscle scars over and becomes rigid and unable to contract, diminishing the heart's ability to pump blood. The ultimate goal of Gaudette's team is to use the regenerative capabilities of adult stem cells to transform portions of that scarred tissue back into working heart muscle. "Earning this gold-standard, competitive award from the National Institutes of Health is a wonderful affirmation of the work Professors Gaudette and Pins are doing, and the importance of the collaborative model of research our faculty are pursuing," said WPI Provost Eric Overström, PhD. "Over the past 10 years WPI has invested strategically in life sciences and bioengineering programs because the convergence of biology and engineering will enable a range of new therapies and medical devices that will improve human health." Earlier studies by Gaudette and others have shown that when human mesenchymal stem cells (hMSCs), which are derived from bone marrow, are implanted in damaged hearts, they moderately improve cardiac function. The main limitation of these studies was getting large numbers of hMSCs to engraft into the damaged heart tissue. The methods used at the time—injecting the cells into the bloodstream or directly into the heart muscle—yielded very low results, with 15 percent or less of the cells injected actually surviving and attaching to the heart muscle. Most cells were washed away by the bloodstream. To improve cell delivery, Gaudette and Pins developed the microthread technology as a provisional "scaffold" or a temporary structure to carry the cells into the damaged heart tissue. In early studies, the WPI team was able to grow up to 40,000 adult stem cells on each centimeter of a microthread suture. When the microthreads were stitched into an infarcted rat heart, more than 60 percent of the cells successfully engrafted into the cardiac muscle. Over the next five years, the team will work to improve the technology in several ways in hopes of pushing cardiac cell therapy closer to human trials. "Congratulations to WPI, as well as Professors Gaudette and Pins, on receiving this NIH grant," said Massachusetts Congressman Jim McGovern. "WPI has a well-deserved reputation as a hub for national biomedical collaborations and cutting-edge advances, and this award is testament to the brilliant work being done there day in and day out." Through the new grant, the research team will attempt to optimize the adhesion of stem cells to the microthreads by adjusting the composition of the threads and the process used to grow cells on the threads. 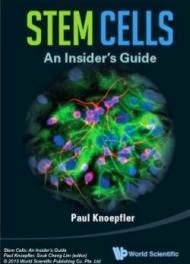 They will use two different types of cells: hMSCs and induced pluripotent stem cells (iPSCs), which are adult human skin cells reprogrammed to act like stem cells. 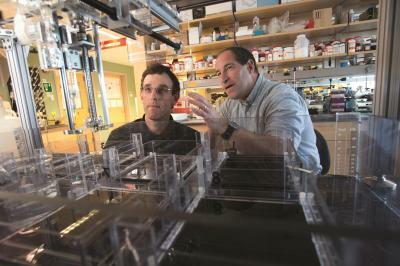 They will evaluate the ability of each cell type to engraft and promote regeneration in an infarcted rat heart. The iPSCs will be developed in the Laflamme laboratory and cultured in a way that promotes their differentiation into heart muscle cells known as cardiomyocytes. "Michael Laflamme is a leader in the field of using induced pluripotent stem cells for cardiac regeneration and we are thrilled to be working with him and the team at Washington," Gaudette said. After stitching the cells into the damaged hearts, the team will use novel imaging and analytic techniques to determine whether the cells are promoting muscle regeneration and improving the mechanical function of the infarcted heart. Finally, the team will add another class of cells, one that promotes blood vessel formation, to the microthreads to see if it, in combination with the stem cells, can augment the regeneration of the damaged cardiac muscle. "This is a great example of translational research that combines biomedical engineering expertise with advanced stem cell biology. By bringing these teams together through collaborative research, we accelerate the development of clinical solutions." said Michael Manning, PhD, associate provost for research ad interim at WPI.